Ancient Egyptian art is the painting, sculpture, and architecture produced by the civilization in the Nile Valley from 5000 BCE to 300 CE. Ancient Egyptian art reached considerable sophistication in painting and sculpture , and was both highly stylized and symbolic. The Nile River, with its predictable flooding and abundant natural resources, allowed the ancient Egyptian civilization to thrive sustainably and culturally. Much of the surviving art comes from tombs and monuments; hence, the emphasis on life after death and the preservation of knowledge of the past. In a narrower sense, Ancient Egyptian art refers to the second and third dynasty art developed in Egypt from 3000 BCE and used until the third century. Most elements of Egyptian art remained remarkably stable over this 3,000 year period, with relatively little outside influence. wadi:A valley, gully, or stream bed in northern Africa and southwest Asia that remains dry except during the rainy season. Ancient Egypt:A civilization that existed in the valley of the Nile River from 3150 BC to 30 BC. Noted for building the Great Pyramids of Giza. pyramid:An ancient massive construction with a square or rectangular base and four triangular sides meeting in an apex, such as those built as tombs in Egypt or as bases for temples in Mesoamerica. Ancient Egyptian art includes the painting, sculpture, architecture, and other arts produced by the civilization in the lower Nile Valley from 5000 BCE to 300 CE. Ancient Egyptian art reached considerable sophistication in painting and sculpture, and was both highly stylized and symbolic. Much of the surviving art comes from tombs and monuments; hence, the emphasis on life after death and the preservation of knowledge of the past. In a narrower sense, Ancient Egyptian art refers to art of the second and third dynasty developed in Egypt from 3000 BCE until the third century. Most elements of Egyptian art remained remarkably stable over this 3,000 year period, with relatively little outside influence. The quality of observation and execution began at a high level and remained so throughout the period. Ancient Egypt was able to flourish because of its location on the Nile River, which floods at predictable intervals, allowing controlled irrigation, and providing nutrient-rich soil favorable to agriculture. Most of the population and cities of Egypt lie along those parts of the Nile valley north of Aswan, and nearly all the cultural and historical sites of Ancient Egypt are found along riverbanks. The Nile ends in a large delta that empties into the Mediterranean Sea. The settlers of the area were able to eventually produce a surplus of edible crops, which in turn led to a growth in the population. The regular flooding and ebbing of the river is also responsible for the diverse natural resources in the region. Natural resources in the Nile Valley during the rise of ancient Egypt included building and decorative stone, copper and lead ores, gold, and semiprecious stones, all of which contributed to the architecture, monuments, jewels, and other art forms for which this civilization would become well known. High-quality building stones were abundant. The ancient Egyptians quarried limestone all along the Nile Valley, granite from Aswan, and basalt and sandstone from the wadis (valleys) of the eastern desert. Deposits of decorative stones dotted the eastern desert and were collected early in Egyptian history. The Prehistory of Egypt spans the period of earliest human settlement to the beginning of the Early Dynastic Period of Egypt in ca. 3100 BCE, beginning with King Menes/Narmer. The Predynastic Period is traditionally equivalent to the Neolithic period, beginning ca. 6000 BCE and including the Protodynastic Period (Naqada III). The Predynastic period is generally divided into cultural periods, each named after the place where a certain type of Egyptian settlement was first discovered. However, the same gradual development that characterizes the Protodynastic period is present throughout the entire Predynastic period, and individual “cultures” must not be interpreted as separate entities but as largely subjective divisions used to facilitate the study of the entire period. 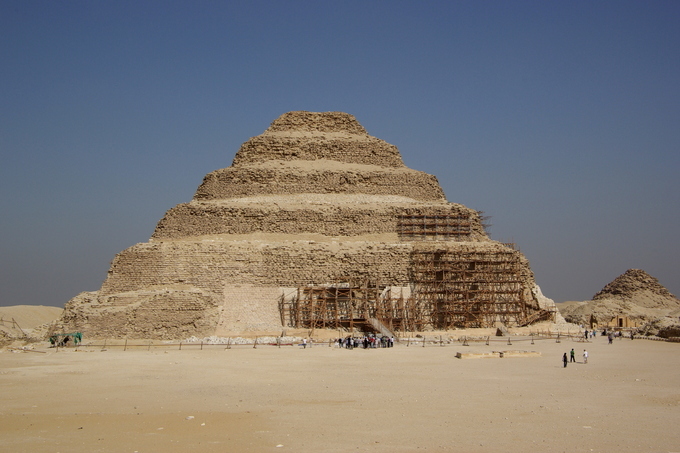 Djoser pyramid: Step pyramid of Djoser at Saqqara, Egypt. The Middle Kingdom of Egypt is the period in the history of ancient Egypt stretching from the establishment of the Eleventh Dynasty to the end of the Thirteenth Dynasty, between 2055 and 1650 BCE. During this period, the funerary cult of Osiris rose to dominate Egyptian popular religion. 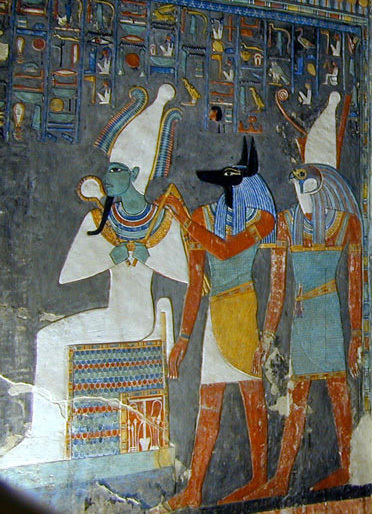 Osiris: The gods Osiris, Anubis, and Horus, from a tomb painting. The New Kingdom of Egypt, also referred to as the Egyptian Empire, is the period between the sixteenth century and the eleventh century BCE, covering the Eighteenth, Nineteenth, and Twentieth Dynasties of Egypt. The New Kingdom followed the Second Intermediate Period and was succeeded by the Third Intermediate Period. It was Egypt’s most prosperous time and marked the peak of its power. The Ptolemaic dynasty was a Macedonian Greek royal family which ruled the Ptolemaic Empire in Egypt during the Hellenistic period. Their rule lasted for 275 years, from 305 BCE to 30 BCE. They were the last dynasty of ancient Egypt.